The mighty Yangtse river (see photo) marks the border between Tibet and Szechuan. On the other side is the small border town of Batang, tonight's destination. Before we could get there we had to climb a 5000m pass, then one of 4000m to get to the valley of the Mekong river. 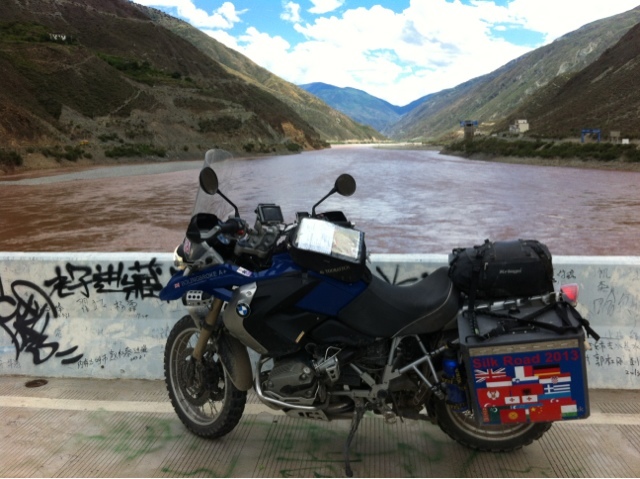 Then another 4300m pass and another 4200m to reach the Yangtse. That's a lot of climbing. The day settled into a rhythm of switchbacks, cliff hugging roads, roaring rivers and police checkpoints. The scenery was breathtaking all day though the concentration needed to avoid rockfalls and washouts meant that you needed to remember to look up from time to time. As we moved east we seemed to leave behind the arid, high, gazing country and move into the hot damp, barley and rice growing areas. It certainly got very hot. A taste of things to come.